Posted with permission from Greg Liken @ Meridian District Library. Be sure to check out their blog! Librarians at Boise State University have the right idea. 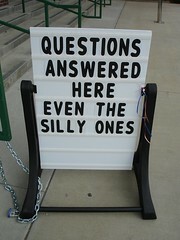 They've got their philosophy of service posted on a sign right out front: "Questions answered here, even the silly ones." How cool is that? Imagine you're 18 (or 35, or 50), exploring your college campus for the first time. Imagine the impact that one simple sign would have on your impression of librarians. How great to think that instead of the scowling man in tweed you expected, you found a gracious staff of librarians inside, eager to help. I've been thinking about that sign today as Meridian public schools begin their year. We're down the road from both the middle school and high school; so for many Meridian teens, back to school means afternoons at the public library. And I got to wondering what sort of "sign" those kids see when they walk into our building. Do we brag about our service? Do we invent new ways to help? Or do we brace ourselves for the rowdy onslaught and shake our fists at the first mention of MySpace? I looked around our building and was encouraged by what I found–clean, well-lit study booths; large tables; big, comfy chairs; nothing besides the usual "no skateboarding in the flowerbed" signs to make us seem inhospitable. But when the teens rolled in after their first day of classes, I felt embarrassed that I'd done nothing to welcome them back. So I stood and greeted as many of them as I could. With so little forethought, the best welcome sign I could offer was a librarian's smile. And I felt pretty good about that small gesture–until dinner. My regular restaurant had a new, hand-scrawled sign on the door: "Restroom for paying customers only." The convenience store down the block had two declarations of its own: "Two students in store at a time," and "Leave backpacks outside"–signs that left no doubt how these businesses felt about the students' return. Suddenly my small gesture wasn't nearly enough. Our library is in a great place–has a tremendous opportunity–to offer our neighborhood teens engaging and inspiring service, free of the "paying customer" mentality. We're not there yet. But we could begin taking small steps today, and make long-range plans to give incredible service when the students return next fall.